The water status of plants and how to measure it, has received much attention in recent years – and for good reason. Plant moisture stress (PMS), or plant water potential, indicates the demand for water within a plant. PMS integrates the soil moisture tension in the rooting zone (the water supply), the resistance to water movement within the plant, and the demands for transpiration imposed by the environment (heat load, humidity, wind, etc.). Thus a PMS measurement indicates the water status of a plant from the “point of view of the plant”. PMS also tells how the environment affects the plant. This information can be used to evaluate how much need the plant has for water or how well it is adapted to its environment. PMS is measured by using a Pressure Chamber which is sometimes referred to as a “Pressure Bomb” or “Plant Water Status Console”. The sample is then placed in a chamber with the cut surfacer protruding through the chamber lid. Pressure is increased slowly while the cut surface of the sample is observed. When water first appears at the cut surface, (red arrow) the chamber pressure is recorded. The pressure required to do this is equal to the tension of the water column at the time the sample was cut. If a low pressure (e.g. 3 bar or 45 psi) is sufficient to force water to the cut surface of the sample, the plant is under relatively low moisture stress (high water potential) and probably has sufficient water for its growth process. But if 20 bar pressure is required to force water to the cut surface, the moisture stress is relatively high (low water potential). The significance of the level of plant moisture stress varies with species. For wine grapes, 18 bar is about the permanent wilting point. In other species, however, 20 bar stress may be common under ordinary field conditions. Douglas-fir trees may survive stresses as high as 50 bar. On the other hand, succulent plants or new shoot growth may wilt at stresses as low as 7-8 bar and certain physiological processes such as photosynthesis may be reduced or impaired at stresses as low as 10-15 bar. The Plant Moisture Stress (PMS) reading at any given time reflects the plant’s interaction with the water supply and the demand for water placed upon the plant by its environment (see above diagram). Since these factors are almost always changing, PMS is nearly always changing. The time of measurement therefore requires careful consideration. PMS is most at midday and least just before sunrise. Pre-sunrise PMS values will usually reflect average soil moisture tension, if the soil is uniformly irrigated. Midday PMS values reflect the tension experienced by the plant as it pulls water from the soil to satisfy the water demand of the atmosphere. There are three basic aspects of understanding Plant Moisture Stress. 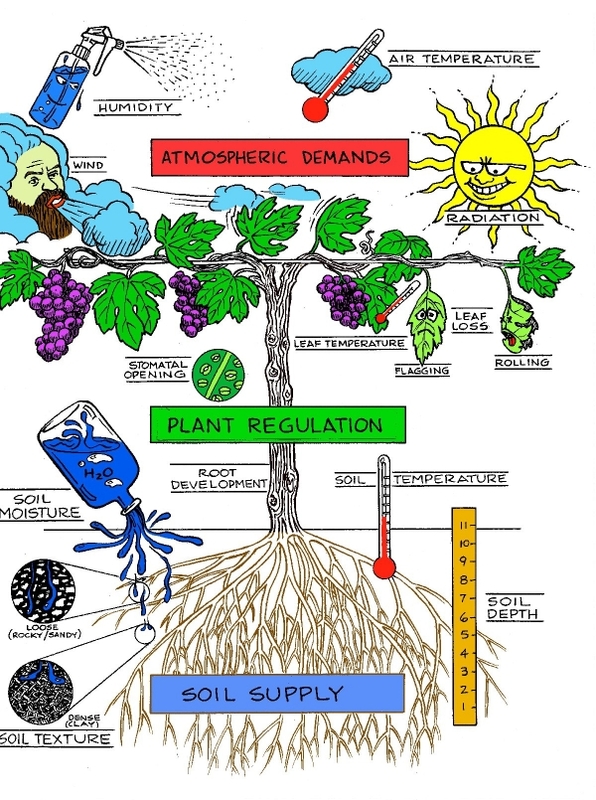 Atmospheric demands on the plant, Plant Regulation or how the plant reacts to water stress and Soil Supply or the composition of the soil. The atmosphere of the plant puts four different demands on the plant as shown in the diagram. The plant regulates water stress by opening and closing the stomata (small holes) on the backside of the leaf. 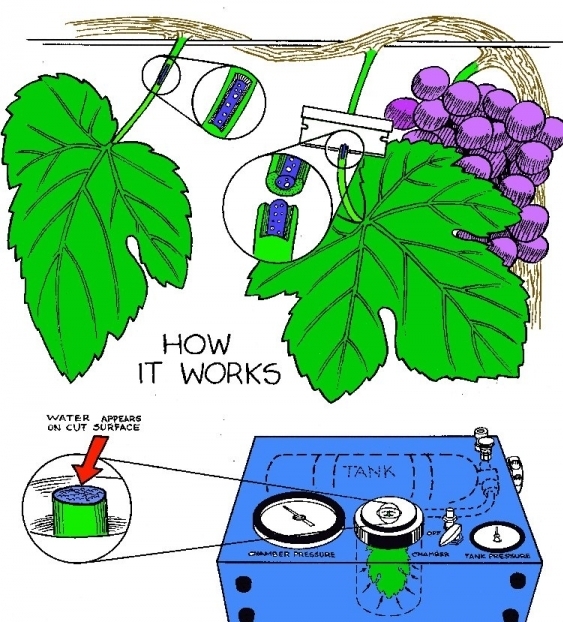 Other regulators used are leaf flagging, rolling and leaf loss. Good root development is also key in regulating water stress. Soil composition is critical for the plant. Obviously moisture content is a key factor in PMS. In addition the temperature of the soil and depth will influence PMS. Depending upon the texture of the soil and how it holds moisture is another important aspect of the soil. Loose sandy soil will loose drain out moisture quickly while heavy clay will hold moisture longer.